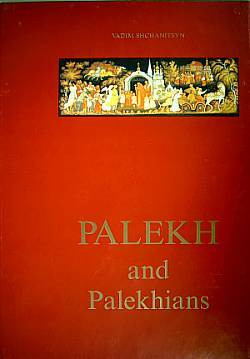 This book focuses on the art of Palekh, one of the four villages known for the world famous lacquer boxes. In fact, the book was put together by a renowned lacquer box artist there, Vadim Shchanitsyn, who provides unique insights into the village and artists. Also included are narratives and information on dozens of favorite fairy tales and themes of Russian lacquer art. The book is illustrated at the end with 133 pictures of notable Palekh art works. All copies that we have are new with only minor scuffs from transport. This hard-to-find book is out of print and is a great resource for lacquer box collectors.